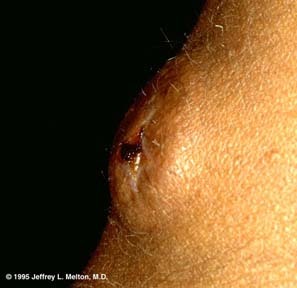 This granular cell tumor is a firm, hyperpigmented, dermal nodule on the shoulder. The most common location of granular cell tumor is the tongue, and the next most common site is the skin. Granular cell tumors may also be found internally, particularly in the aerodigestive tract. They are benign.